From the moment you cross the threshold of the Home Studio of Celebrity Portrait Artist Anthony R. Whelihan, you get the feeling that you’re not in Kansas anymore. And it just so happens that a portrait of Judy Garland, There’s No Place Like Home, painted by Whelihan, hangs in the Judy Garland Museum in Grand Rapids, Minnesota. He has captured the attention of Art Collectors from around the globe with his brilliant use of color and his ability to tell the story in imagery. Look close, then look again, as what is first seen soon becomes part of another 3-D image. 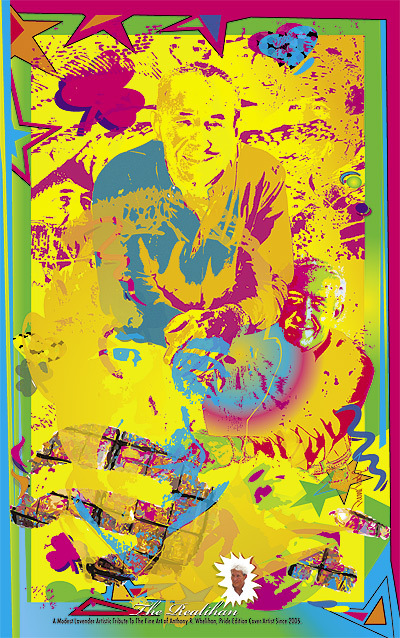 Whelihan has been commissioned by the NFL Alumni, Disney, The U.S. Senior Open, The Bruce Lee Foundation, The Nobel Conference, and The 80th Birthday portrait of B.B. King, as well as numerous celebrities from film, music, and theater. His work with watercolor and silkscreen is reminiscent of Warhol, Max, and Neiman, but with a modern flare and raw talent. His use of juxtaposition creates images from within, and engages the viewer with apple temptation. His stories are woven into the work like that of a seasoned teller of tales. To engage Whelihan about his work is to open Pandora’s box, as one story leads into another with relentless enthusiasm and energy. As one proud collector puts it, “You can’t just have a Whelihan,” comparing her passion to the irresistible taste of certain potato chips. Whelihan now is preparing for his latest exhibition, “Celebrity Portraits,” opening in Plymouth this October. This collection includes many of the commissions he has received over the years. An entire collection of celebrity portraits will be shown for the first time: Ray Charles, Bruce Lee, Natalie Cole, Bonnie Raitt, Bud Grant, Paul Molitor, Bill Cosby, a series on the Minnesota Vikings, Gladys Knight, selected NFL recipients of the NFL Alumni’s Players of the Year Awards, Ex-Timberwolves KG and Wally Szczerbiak, and many more. Many of these works have been signed by Whelihan, and autographed by the celebrity. Have you ever had the opportunity to attend one of the many Studio Tour receptions and dinner parties at the Home Studio of Whelihan? Don’t pass up this unique experience. Whelihan and his partner of 25 years, Tim Henning, are the dynamic duo when it comes to entertaining and raising funds for great organizations. 2008 marks the fourth consecutive year that this prolific artist has created the artwork exclusively for the cover of the Lavender Pride Edition. The original artwork will be auctioned off live onstage at Because We Care Bohemian Cirko benefit on June 14. Whelihan introduced a Photo Submission Contest in 2007. The winning photograph by Jody Herold has been incorporated into the artwork on this year’s cover. Whelihan presented her with a signed Artist Proof of the cover art at the June 5 Pride Edition Kickoff at the Chambers. Check out this year’s new Whelihan Contest on page 48 of this issue, and visit the World of Whelihan at www.Whelihan.com. Tony–Please contact me by email. I now live in California. I purchased from you probably 15-20 years ago–2 Monas–fish in the sea-Marilyns.